A well-designed email campaign conveys the company`s message, creates a smooth path for conversion. Great email design reduces friction and anxiety during reading and motivates the reader to take action. In this article we’ll see how you can use the power of icons to create successful and competitive emails that really work. How can icons help with your email campaign? Icons help organize the content. Icons express ideas straighter and simpler. Icons support your brand identity. Icons can reinforce interactive elements. Let`s go through some examples to learn how icons can help in email marketing. Dont forget to download the free icon pack for your email marketing here, no strings attached. #1. Icons help organize content. In emails we usually expect to only see social media icons while on webpages other icons are used more frequently. Still, each email can engage icons in order to illustrate your product`s or service`s features. Couchsurfing uses icons to inform subscribers about its features. In this case, icons are used with text labels. In contrast to the most conventional icons (like “email”, Facebook or “play”) graphics like these can`t replace words — they are used to reinforce a text message, make it shorter and evoke interest. to split email blocks making the message clearer and more organized. Coursera applies icons to create visual diversity and highlight the main features of one of its educational programs. Traditional ways of organizing the content such as paragraphs, underlined links and headlines in bold just don`t have the same level of visual appeal as columns with icons on top. AliExpress uses the power of icons to illustrate the process of its marketing campaign. Here icons are also used in addition to text information to provide easily-scannable content and diversify it visually. Without typing a word the company informs its clients about the four steps of the campaign and makes it very visually appealing at the same time . Illustrative icons cannot completely convey the message without supporting text. Their objective is to strengthen the copy, help split the content and make it easier to grasp. That`s why these graphic icons can be quite abstract and non-conventional. #2. Can we use Icons in emails instead of words? As people stop reading messages in detail, a successful email should be made in a way that can be easily and quickly scabbed. Big blocks of text can be too difficult and tiring to read. Icons help replace words with easily-understandable graphic signs. There is a long ongoing discussion about the question: can icons be used instead of words? Where should we replace words with icons and where should we not? work well on international websites where well-known graphic elements help communication. they are very similar to objects which they represent (printer icon). In other cases, if you feel someone can misunderstand the meaning, icons should be applied to text labels only. This makes certain elements stand out from the field and adds visual interest, which, in the end, improves the scalability of an email. In this example the email starts with an ad where the call-to-action button is made without words. As this email has nothing to do with brushes, an arrow icon helps organize communication with the ad without obsessive calling to click or buy. And here it`s hard to imagine icons without text labels as their meaning will be unclear. #3. Use Icons in email instead of images. Images in emails are great. However, they have three principal drawbacks. They need to be downloaded. They can be blocked by email clients. They can look different in different apps. No doubt, icons are less expressive and can`t be used in place of any visual material. Nevertheless, if you use your pictures to convey some meaning (not create style or emotion), they can be easily replaced by SVG-graphics which are easy to download and look the same for all email clients. Icons sometimes replace pictures in digests. It makes them look style-consistent and avoid stock photography, which so often kills the style. Coursera`s digest with some icons used. Tympanus`s digest with icons applied. Companies also use icons instead of pictures to diversify the text and make it look better. In this case, a designer can use different sets of icons depending on the topic of the message, but apply the same visual strategy each time to work out the recognizable style of your company`s mailing. Companies use icons in applications and websites to organize content, provide conversion and simplify the message. If icons are a great part of your brand identity you should definitely use them in your email campaign. Emails do not exist in a vacuum — they are part of your overall design and brand strategy. The more consistent it is — the more loyal clients and prospects you get. Brussel Airlines puts icons on top of the message, showing the range of services it can provide. Here, icons have multiple functions which otherwise could be performed only by implementing many different types of media. They indicate services, help organize content, create visual appeal and work as buttons (interactive elements). They are also designed in the company’s corporate color which strengthens brand identity. #5. Icons can reinforce interactive items. No email is sent without a purpose. Each of them has interactive elements which encourage customers to take action. While traditional links are still widely used in email marketing (remember the last Coursera example? ), today emails look more like landing pages all created around the main hero — call-to-action. Can icons be used as CTAs? Yes, but very carefully. Perhaps, icons can`t compete with CTA buttons, which have become the icing on the cake of every newsletter. Emails convert well when they convey a clear message, bring interest, but use understandable and conventional interactive elements. Today the most usable interactive icons are social media icons. But icons can add value to CTAs and create additional motivation to take an action. That`s why they are often used on CTAs together with copy to reinforce the action the button wants you to take. Buttons with copy, strengthened with icons. In addition to that, icons are great items to get animated and can work as good triggers to take an action. 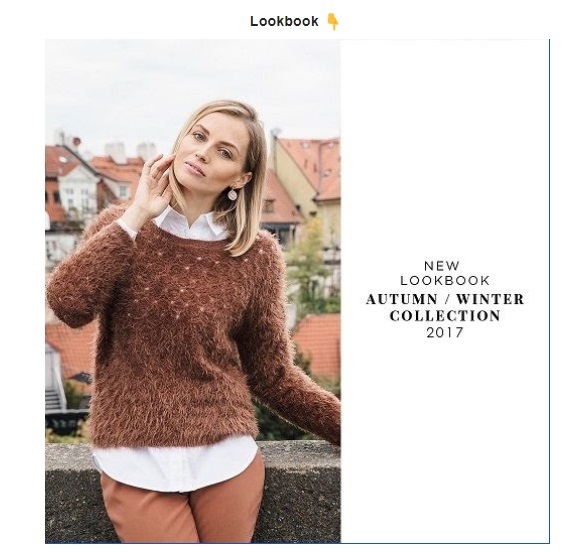 For example, Zarina used an animated icon pointing down to draw attention to its new lookbook (I clicked without hesitation). Getting back to the same example, we`ll see that Goodreads use icons in advertising banners at the top and bottom of the page. While to promote its main content they apply a traditional CTA (“Read More”), in ads it would look too excessive. An icon with a circled arrow shows that it`s clickable (and it`s quite clear), but does it delicately and silently, without drawing attention from the main point of the letter. Email campaigns can work without icons, but the times require fast-changing and fast testing. Icons can help email marketers, not only to share the message but also involve and intrigue the audience, lead prospects to take an action and increase conversion. If you feel your content is boring and not organized. Split it into blocks, put an icon in front of each one. Visualize your ideas and diversify content. If you want to give text labels effective visual equivalents. It makes scanning easier and produces positive emotions. If you want to make visuals style-consistent. Get rid of cheap stock photography and apply well-designed graphics. If you are trying to stick to your brand identity. Take the most common icons from your web page and put them into the newsletter. If you want your CTA’s to be really strong. Provide additional motivation using icons together with other interactive elements. For that purpose, Icons8 prepared a free pack of icons exclusively for emailaudience readers. Andrew Burmistrov is a usability specialist & content manager of Icons8. He started his career as a support specialist, telling jokes while customers were rebooting their computers, before finding his true passion - writing useful & relevant articles.